I have a list of files and folders on a text file and would like to delete some files/folders. I like to delete them without going into each folder and press delete. I was thinking of a program that you put a list of files/folders to delete and it will delete them. What about a simple batch file? 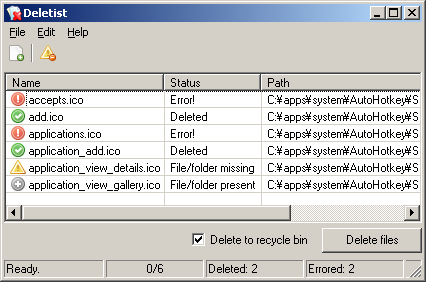 Also depending on your file manager you may be able to "load" a list of files into a file panel and then delete them. Edit: for AutoHotkey users a basic file parsing Loop and the FileDelete command will do the same as the above batch file solution. The nice part about using BleachBit is that you can securely wipe those folders rather than just deleting them. On a related note, the program includes support for "Winapp2.ini" functionality, which is a community project that enables custom file and folder delete settings. Some of those files and folders might also include some of what you're looking to zap. Thank you for your tip, I'm more comfortable using a gui than the command line, the batch file is my last option. Thank you for showing bleachbit, I used that before did not know it could do that, I will download it again. Batch Delete is naively written in AutoIt by me and has abolutely no warranty. I CANNOT under any circumstances be held liable for any problems that might result from the use of this program. Your use of the program would mean you fully accept the above. starstuff wrote: I have a list of files and folders on a text file and would like to delete some files/folders. I like to delete them without going into each folder and press delete. I was thinking of a program that you put a list of files/folders to delete and it will delete them. Does anybody know of an app that do this? It will be a bonus if it can delete files on the network like \\Network-PC\files\delete.me. Well, I doubt this will work with files on a network. For safety, by default, the files and folders (C:\ drive ONLY, I think) are deleted to the recycle bin. However, if the "/s" option is used (eg. C:\Folder J\*.txt /s), files will be deleted from all subfolders using the DOS "del" command and the files will NOT go to the recycle bin. The use of any software cannot be considered risk-free and I think that a program that is based on batch-deletion is particularly dangerous. As a minimum, you ought to create a system restore-point before using this. Last edited by Ding-A-Ling on Wed Nov 21, 2018 2:40 pm, edited 5 times in total.